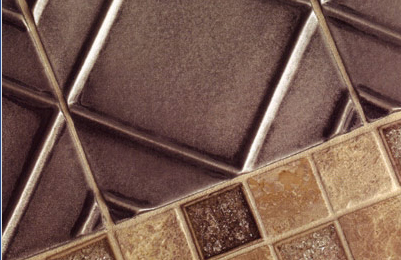 We have an extensive collection of metallic tiles that will add a dramatic, yet elegant statement to any tile design. We have metallic tiles that are available as solid metal, as well as, ceramic and porcelain tiles, with painted metallic finishes. Metallic tiles can be used alone as "field" tiles or inserted as an accent with other tiles. 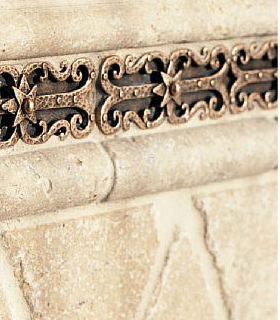 Our metallic tiles are available in an array of finishes. These tiles are suitable for walls, floors and backsplashes. The lyrical designs of Raven Hill Forge are inspired by the beautiful hand forged decorative hardware once ubiquitous in finer American Homes. 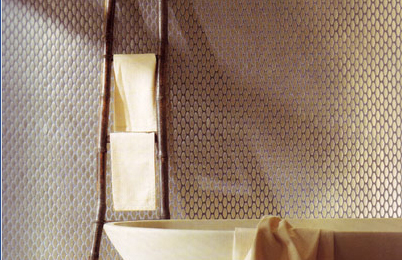 Metallismo's metal mosiac is used as an accent on the bathroom walls. 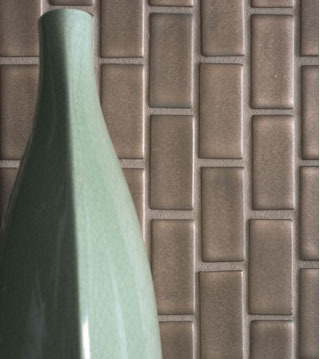 Sonoma Tilemakers mixes metal field tiles with glass mosaic tiles.